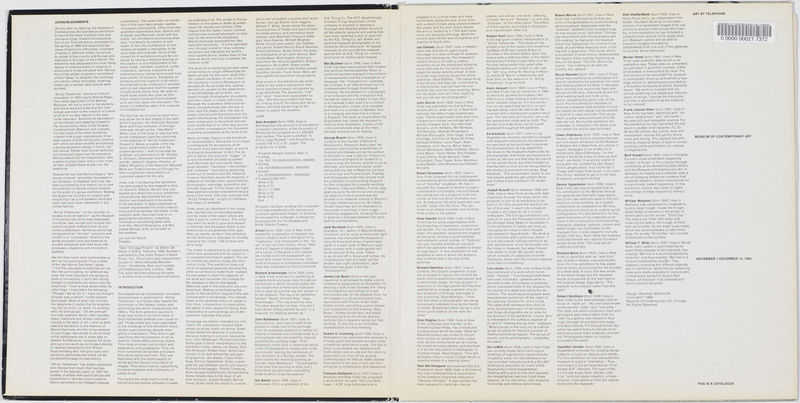 Shortly after its opening, the Museum of Contemporary Art planned an exhibition to record the trend, incipient then and pervasive today, toward conceptualization of art. 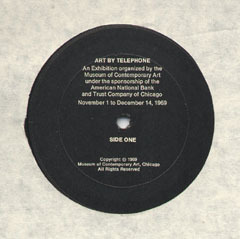 This exhibition, scheduled for the spring of 1968 and abandoned because of technical difficulties, consisted of works in different media, conceived by artists in this country and Europe and executed in Chicago an their behalf- The telephone was designated the most fitting means of communication in relaying instructions to those entrusted with tabrication of the artists' projects or enactment of their ideal. To heighten the challenge of a wholly verbal exchange, drawings, blueprints or written descriptions were avoided.